For tomorrow's race, watch out for some exciting action as Marc Marquez's timings haven't been that far ahead of the rest of the chasing pack. Though this is more likely down to the difficult conditions caused by high track temperatures rather than a loss of form. 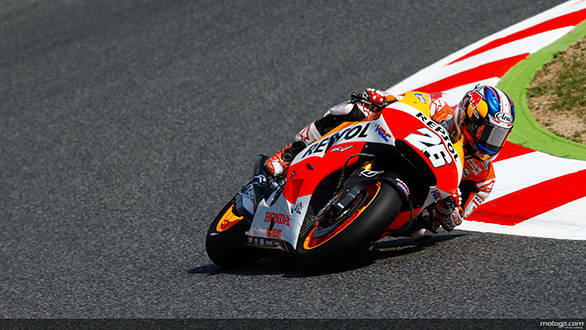 Don't be surprised if he takes off like a scaled rabbit (as usual) with Rossi and Lorenzo hot on his heels again. Esteve Rabat clinched pole position in Moto2 finishing just ahead of Mika Kallio and Maverick Vinales. Rabat's lap was over half a second clear of second place Kalio so look for him to try and make a brake for it in the opening laps tomorrow. Kalio will be looking to prevent him from doing just that and pull back some of the 22 points between him and the championship leader. Sandro Cortese, Jonas Folger and Maddia Pasini rounded off the second row. They will all be looking for their first wins of the season so you can be assured of some close battles. Alex Marquez took his first pole shattering the Catalunya pole record in the process with a 1m50.232s lap. Enea Bastianini qualified a close second with Alex Rins completing the front row. Alex's session also ended with him crashing out, leaving the track on a stretcher. Brad Binder from Mahindra racing gave the team its best grid position of the year, qualifying at fourth. Niklas Ajo managed to wrangle the Husqvarna to fifth on the grid just ahead of Isaac Vinales. Championship leader Jack Miller missed out on qualifying, finishing in ninth. His closest rival, Romano Fenati will line up in a lowly 16th so he shouldn't be too worried for tomorrow's race.